The majority of UK skiers tend to book a package that includes flights and transfers, organise their own flights or even drive down. All of which have their advantages and disadvantages. There is another way to get to the Alps though, by train! It often doesn’t even enter into consideration for many skiers, the feeling being that the French Alps are simply too far away to make the train a viable option but in actual fact it doesn’t take much longer than flying and is often quicker than driving down. There are other more tangible advantages than how long the journey takes. The journey is more comfortable; generally you will have a table between 4 passengers. The trip is one long smooth trip, rather than the “stop – start” nature of flying out. Whether you use this time to organise lift passes, ski hire and other holiday admin online by using the free wi-fi or watch movies and play cards, it’s a lot more enjoyable than being cooped up in an airport or on a flight. If you take the service that leaves on the Friday afternoon and leaves the Alps on the Saturday evening, you can actually fit in an extra 2 days skiing. This is perhaps the main reason why keen skiers love taking the train down. Transfer time from the train station to resort is often more like 40 minutes rather than the 3 hour slog from Geneva or Grenoble. Moutiers- serving Courchevel, Meribel and Val Thorens as well as La Tania, Mottaret and St. Martin. Bourg St. Maurice: Serving Les Arcs, Val d’Isere, Tignes, La Rosiere and Ste. Foy. 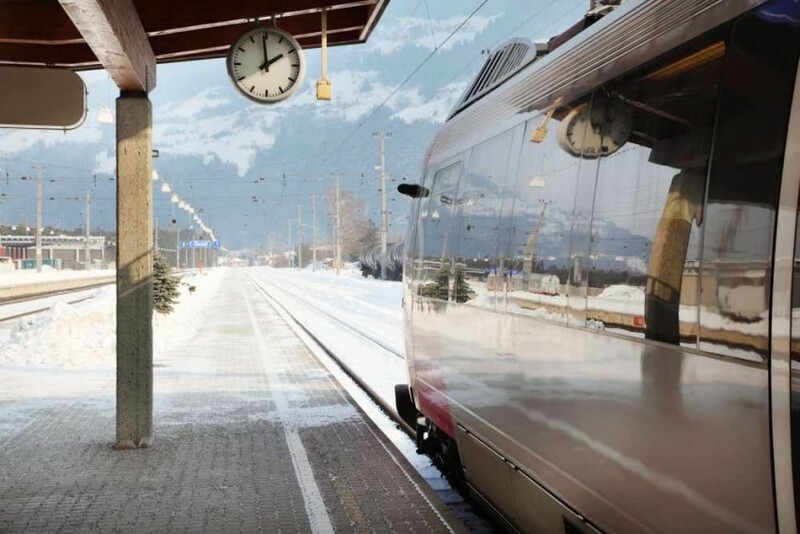 If you decide to take the train to the Alps, its very important that you speak to us first before booking because arrangements for arrival and departure must be made with your chalet provider and cannot always be guaranteed. You will be arriving very early on the Saturday and leaving late on the following Saturday, you will therefore need somewhere to leave your luggage on arrival as well as somewhere to change into your ski gear. On the way back home, you will leave the chalet at least 9 hours before your train is scheduled to depart, it is always a good idea to organise a place to leave your bags as well as somewhere to change and shower before you jump on the train at the end of the week. Whilst this is possible with lots of properties, it should never be assumed to be included.